Had you popped in here during the 1980s, you may well have found Spectator columnist Jeffrey Barnard propping up the bar. In fact, it’s this very pub that Keith Waterhouse immortalised in his play Jeffrey Barnard is Unwell. In contrast to many Soho pubs the Coach and Horses is light and airy, and feels like it hasn’t changed much from the 1970s. Private Eye have their fortnightly lunches upstairs in what was once advertised all around and outside the pub as 'secret tearooms' (unusually, you have to pass behind the bar to reach the stairs), and on an evening you might well catch a piano sing-a-long or local watercolour artist. Those oxymoronic 'secret tea rooms' signs are now gone. In recent years, the Coach has gained an unexpected reputation for its vegetarian and vegan kitchen. We were particularly taken with the tofush and chips. The pub’s famously rude landlord, Norman Balon, is now retired so you’re free to sample its reasonable range of beers and meatless dishes in peace. 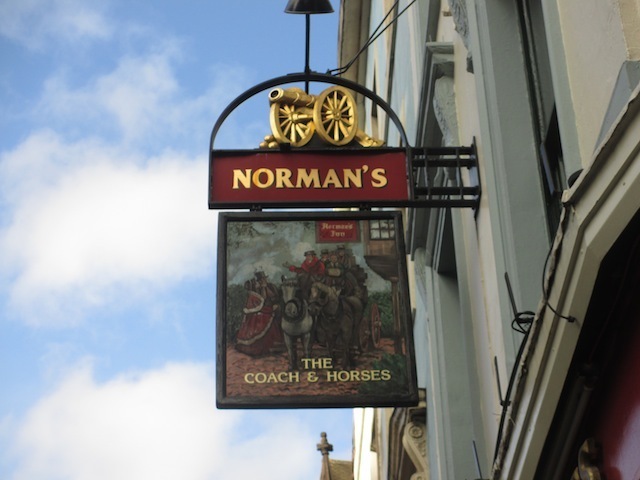 The place is still regularly referred to as Norman's, though, even on the pub sign. Not that the present management are pushovers. Owners Fuller's are keen to manage the bar themselves, a move the current tenant reportedly described as a 'hostile takeover'. 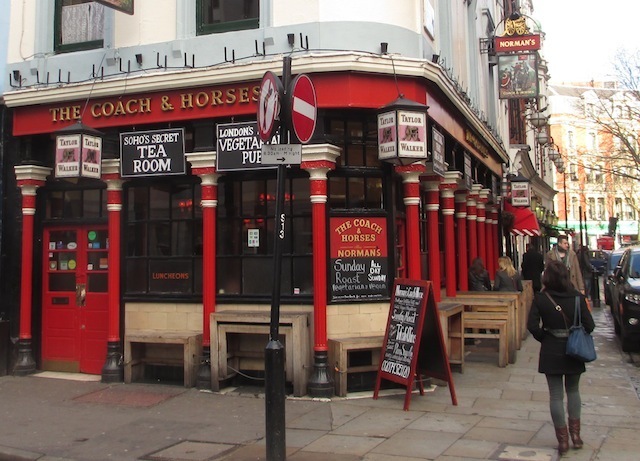 All things must change, but this pub's old fashioned character is part of the fabric of Soho. It would be a shame if the chain owners messed too much with the formula. On Facebook. On Twitter as @CoachSoho. On Instagram.